Mumbai: Employment in the total Indian economy shrank by 0.1% in financial year 2015-16 and by 0.2% in 2014-15. Far from more jobs being created, employment has actually contracted. That is the finding from the latest KLEMS India database, a research project supported by the Reserve Bank of India (RBI) to analyse the productivity of the Indian economy. It is part of the World KLEMS initiative, supported by several central banks, universities and research institutions to analyse growth and productivity patterns across the world. The data is available on RBI’s website. The data, recently updated till 2015-16, shows that employment fell in several sectors. ‘Agriculture, forestry, fishing’, mining, manufacture of food products, textiles, leather products, paper, transport equipment and trade are some sectors in which employment contracted in both 2014-15 and 2015-16. The strange thing is that these were years of high growth, with real gross domestic product (GDP) growing by 7.4% in 2014-15 and 8.2% in 2015-16. But that hasn’t led to growth in employment. There has been much talk of jobless growth, but what we’ve had recently seems to be job-destroying growth. The fall in employment in agriculture is par for the course, as people move out of unviable marginal farming into other occupations. Throughout the world, development has always involved people moving out of low-productivity agriculture into higher-productivity work, thus boosting their incomes. Unfortunately, the data indicates that not all the people moving out of farming in India have been able to find employment in other sectors, let alone productive sectors. Why else would total employment go down in 2014-15 and 2015-16? Where did those who left agriculture find employment? In the two years to 2015-16, 70% of them found employment in the construction industry. The number of people in the construction sector has been steadily increasing. No doubt they have been employed in building roads and other public works, given the poor health of the real estate sector. The problem is that productivity in the construction industry has been declining. The KLEMS database shows that total factor productivity in the construction industry has been falling every year since 2006-07. People are moving out of agriculture into another area of low and declining productivity. 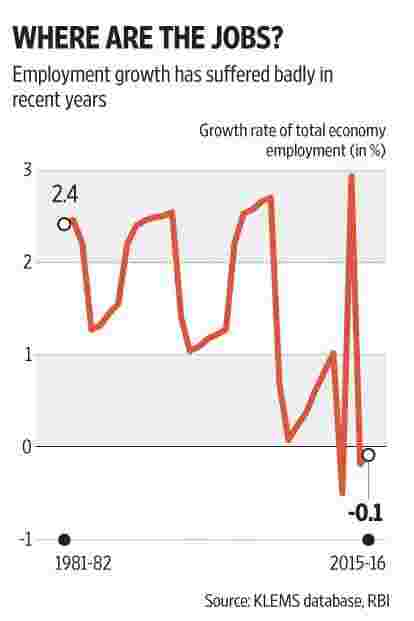 The problem of growth without commensurate employment is not new for India. In the 10 years to 2015-16, the compound annual growth rate of employment, according to the KLEMS database, has been a mere 0.53%. But in recent years, it has got even worse. Surprisingly, as the accompanying chart shows, the employment rate was much higher in the eighties and early nineties, despite GDP growth being lower. The question is: if employment actually shrank when GDP growth was relatively high, what would happen to it in 2016-17 and 2017-18, when we had lower growth and disruption in the informal sector as a result of demonetisation and the introduction of the goods and services tax (GST)?